May was a good month of fishing. Early on it was the usual buck tailing for Rainbows and things were very productive. But once the high water hit, it was a little bit more tricky. Dodging sticks and logs made it a bit difficult, but when we found some clear water to fish, we would just keep doing circles in that area. Average days throughout the month of May consisted of 10 -15 fish coming to the boat. Mostly Rainbows, but still a few Bull Trout mixed in. The usual 2 -3 Lb Rainbows and a bunch of Bulls between 3 – 8 Lbs made up our daily catches. Water temperature is hanging in the high 50’s F, which is perfect for keeping the fish active. 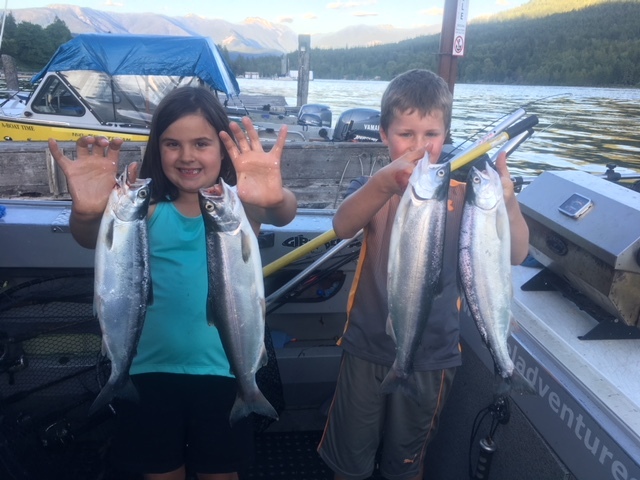 The beginning of June saw our limited 3 day opening for Kokanee on the west arm again, and the boats were out in full force. 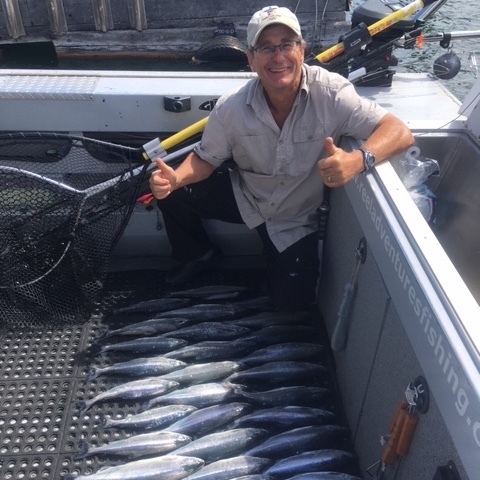 Another successful few days of west arm Kokanee fishing made for some exciting times. Lots of fishermen were done fishing before breakfast even started. That’s the trade off when Kokanee fishing. When its good, you may only get to fish for an hour to retain your limit. 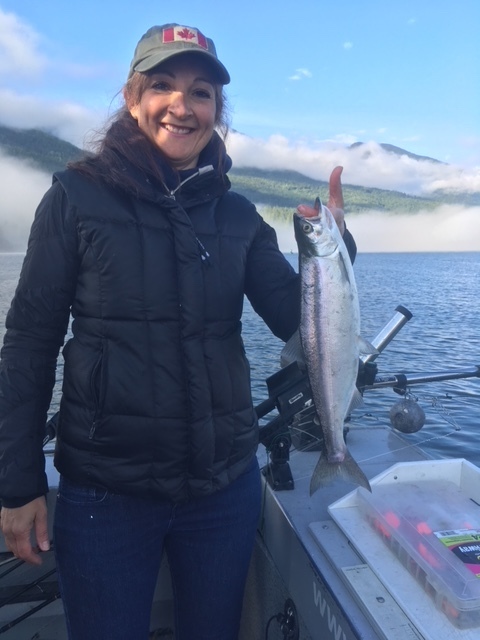 Our groups at the beginning of the month chose to fish for Kokanee in the morning and then venture out on the main lake for Rainbows and Bull Trout for the afternoon. All the groups were rewarded with their limits of Kokanee and also got to fight some high flying Rainbows and a few Bull Trout later on. The weather cooperated for this opening and made for some enjoyable Kokanee fishing. It’s also nice to see all the boats out and it made for a nice social interaction each morning on the water. Look forward to the next short opening in July. Fun times………..
And now that the water has receded, we look forward to more great days on the main lake with guests. The water temperature is perfect and June is usually a good month for fishing. So, stay tuned………….. The river was high for a while and tough to fish, but now has become consistent flows and the fish are very active. Just like the lake, water temperature has a lot to do with it. And now is perfect! The last few outings on the river have produced some great numbers of fish. Some days hooking into 20 – 40 Rainbows has made it very entertaining. Seems like the flyfishing with nymphs is the way to go if you’re in a boat. Although, shore fishing has produced a lot of good fish lately as well. The usual spots have been producing the best fish. Back eddies and current seams are best right now. Walleye fishing has also been doing alright. Some mornings have started with a great Walleye bite and then on to Rainbow fishing for us. This month should be a great month on the river. Stay tuned……. On the lake, it’s been some of the usual bucktail flies, as well as a mix of spoons, plugs, and hockey sticks. My favourite flies lately have been: #326, 310, 315. These are the weighted flies which have helped keep the debris off our lines. Also a few other colors are working good since the water is a bit murky right now. Greens and golds seem to show up better in the dirty water. So, try using Olive/white or Black/white/gold flies. My favourite spoons have been the Gibbs/Delta croc in brass/fire stripe, as well as the gold hockey stick. Gold seems to be the ticket until the water clears up. And on the River, we’ve been fishing either with our fly rods or spinning rods. On the fly, it’s been best using the floating line with an indicator and a nymph in the back eddies. Or a sinking line with the woolly buggers in the tailouts. And, on the spinning rods we have been casting an assortment of spoons & jigs. Or bottom bouncing with bait. It’s that time of year again when we shift our fleet of boats around. 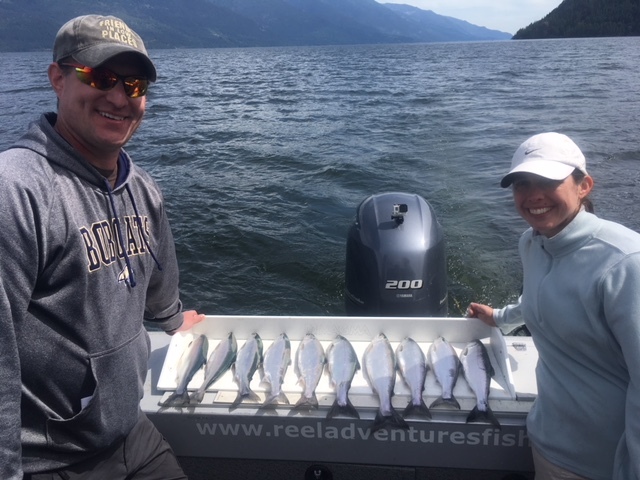 We will be sending one boat to the west coast for our Salmon and Halibut trips for July & August, as well as keeping a couple boats on Kootenay Lake and a couple on the river. So, give us a call, as we can cater to whatever your fishing preference is. The kids showing us how it’s done! An eastern girl with her first Kokanee!